There isn't much that is as American as barbecue, especially slow-smoked pit barbecue, and the First State just happens to be geographically situated next to some barbecue powerhouses like Virginia and the Carolinas. So you would expect to taste some pretty great smoked meat in Delaware, and you would not be wrong. From smoked brisket to Jamaican jerk chicken, follow us into the pit with these 10 awesome barbecue joints in Delaware. Opened in 2012, we are talking pulled pork, slow smoked beef brisket, pit beef, ribs, barbecue chicken, and more. Plus, all sides are made fresh daily, like macaroni & cheese, collard greens, coleslaw, potato salad, and crispy hand-cut fries. But the real secret to this barbecue is that it is cooked low and slow, creating a smoky, juicy product that will make you full and happy. Opened in 2003 with award-winning barbecue and a diverse menu that includes, homemade cornbread, slow-cooked beef brisket, house-smoked bacon, no-filler lump crab cakes, baked beans, and fried pickles, Bethany offers slow-smoked flavors and beach cuisine all rolled into one. Plus, check out their private bourbon stash, because nothing goes better with barbecue. Ribs from Bethany Blues? Yes please! At this award-winning restaurant, Master Chef David Jenkins offers you slow-smoked beef and pork ribs, brisket, pulled pork, chicken, turkey, fresh fish, crabs, and more sides than you could ever eat. We are talking fall-off-the-bone tender meat here, served with Jenkins own barbecue sauce. So, if you like real southern, down-home barbecue, this stop is a First State must. Some call it a restaurant, some call it a roadside barbecue shack, and some call it a truck-stop and ethnic grocery store with a smoker. Whatever you call it, the upshot is delicious Filipino smoked barbecue. With unique spice blends and a knowledge of slow smoking meat, Balan offers fall-off-the bone tender, juicy, flavorful barbecue that is different and delicious. Road side is always the best side. 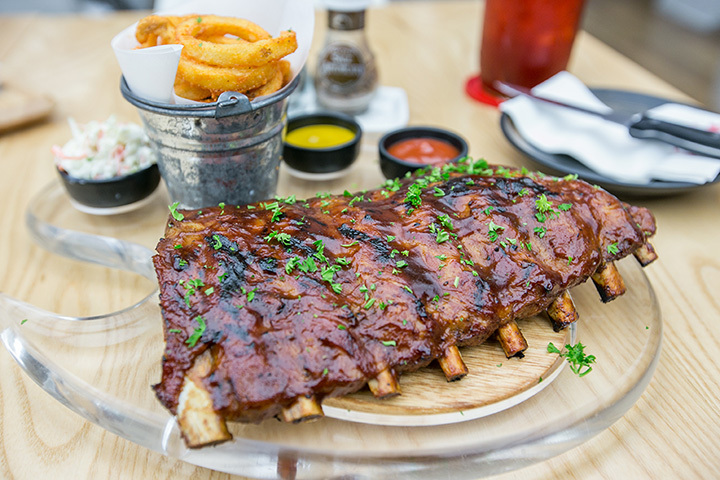 Established in 1995, Young’s offers award-winning and mouth-watering barbecue sauces made from homemade ingredients. You will find pit beef brisket, smoked ribs, turkey breast, and chicken. Plus, their pig roasts are perfect for any occasion, like weddings, birthdays, graduations, baptismal, communions, and more. Get St. Louis-style ribs, smoked chicken, beef brisket, and more. Sit down and eat at the restaurant or walk up to big red trailer. Either way, you will find slow-smoked brisket with mac & cheese, the pulled pork sandwich with fresh coleslaw, and Madison’s signature “Smokin” fries, served with your choice of meat topping and melty cheese. Yum. Starting out as the Wilmington Pickle Company in 2012, Locale BBQ is a family-owned and operated barbecue joint. Now, they slow-smoked everything from pork and chicken to beef and brats. Plus, don’t miss sides like mac & cheese bites, jalapeno cream corn, hush puppies, collard greens, and more. Of course the real star is still the pickle. Founded in 2011, the Karribbean is family-owned and operated offers some unique barbecue items like curried goat and Caribbean jerk chicken. But when you consider that Chef Lincoln was born in Jamaica and grew up in Brooklyn, it all starts to come together, like the mouth-watering barbecue flavors of jerk chicken, pork, and goat. Plus, don’t miss oxtail and hearty stews. Founded in 1941 in Dallas, Texas, Dickey's is still family run and still smokes their meat daily on-site at all of their restaurants. At Dickey’s, you know your meat is humanely raised without antibiotics, and the quality and consistency is top notch. From the St. Louis-style ribs and the slow-smoked beef brisket to pulled pork, and house-made sausage, Dickey’s is good eats. Once again proving that some of the best eats come from food trucks, Uncle John’s features authentic southern-style barbecue that is pit smoked low and slow. The upshot is tender, juicy good barbecue! Plus, get delicious homemade sides, like barbecue beans, cornbread that is so light and moist is could pass for cake, collards, and coleslaw.